The move by Toyota to exit NUMMI likely will result in the loss of more than 4,000 jobs unless the plant is able to find new work. Toyota Motor Corp.’s announcement it would no longer assemble vehicles at the New United Motor Mfg. Inc. joint venture plant in California ends a 25-year experiment that gave the Japanese auto maker its first foothold in U.S. manufacturing and provided the former General Motors Corp. access to the ways of lean manufacturing. Toyota, now well entrenched in the U.S. with vehicle-assembly and components plants in multiple states, announced Aug. 27 it would not continue production at NUMMI beyond March 31, 2010. The decision comes just two months after GM said it would walk away from the Fremont, CA, plant. Production of GM’s Pontiac Vibe was discontinued there Aug. 17, and GM will retire the Pontiac brand completely by year’s end. “After the decision by General Motors to withdraw from the NUMMI joint venture, Toyota conducted a thorough review of its alternatives in light of current and anticipated market conditions,” TMC Executive Vice President Atsushi Niimi says in a statement. GM’s intention with NUMMI, previously a wholly owned GM plant, was to learn the vaunted Toyota Production System of lean manufacturing and apply the techniques at its own assembly plants, while Toyota wanted to tip-toe into U.S. manufacturing at a time when anti-Japanese rhetoric was pervasive amid declining market shares and employment for domestic auto makers. NUMMI not only bore many well-known (and some not well-known) vehicles, including the Chevrolet Nova, Toyota Voltz (a Japan-only version of the Vibe) and Geo Prizm sold by Chevrolet dealers, it also was an early stomping ground for some now high-ranking executives. That list includes newly appointed Toyota President Akio Toyoda, who was a vice president at NUMMI in the late 1990s; Dana Holding Corp. Vice Chairman Gary Convis; and Mark Hogan, the former Magna International Inc. president who now runs his own company. 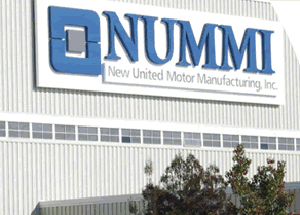 John Krafcik, acting president and CEO of Hyundai Motor America, is another NUMMI alum. “I was the first American engineer hired that wasn’t a GM person or a Toyota person,” Krafcik tells Ward’s of his mid-980s stint. He joined NUMMI nearly fresh out of college as a manufacturing engineer in charge of chassis parts and also shared responsibility for quality control and the audit process. “I felt so lucky and privileged to be there and learning the Toyota production system” in such a unique situation, being in an old GM plant represented by the United Auto Workers union, he says. Krafcik’s Japanese and American bosses soon sent him out to observe and report on conditions at other GM and Toyota operations. At a GM assembly plant in Oklahoma City, he saw workers sleeping in cardboard boxes while the line was moving and found vehicles with numerous quality defects. After a visit to Toyota’s Takaoka, Japan, operation, “it was completely obvious to me within five minutes how revolutionarily different it was from what GM was doing,” Krafcik says, citing the plant’s andon cords that allowed workers to shut down the line if problems arose and up-to-the-second inventory monitoring. But Krafcik, who went on to become an authority on lean manufacturing while studying at the Massachusetts Institute of Technology, believes GM learned quickly and soon began to make changes in its own plants. “For all the criticism leveled at GM during this period, I think they were as profoundly impacted as I was,” he says. Krafcik later visited GM’s now-defunct Van Nuys, CA, plant and saw the results of the auto maker’s commitment to lean manufacturing. Former GM Chairman Jack Smith, who in the early 1980s was GM’s director of global planning and led negotiations with Toyota for NUMMI, told Ward’s in a 2002 interview of the jolt it gave him when he found out it took Toyota only 2,200 workers to build 60 cars per hour on two shifts, while GM needed 5,500 people. NUMMI fortunes have turned quickly. The JV hit record output just three years ago, building 428,633 units in 2006, Ward’s data shows. The Corolla, Toyota’s second-best selling U.S. model, historically has accounted for nearly half the plant’s production. And until as recently as last year, NUMMI was thought to be a logical choice for Toyota to build its best-selling Prius hybrid-electric vehicle, as the majority of Priuses, and hybrids in general, are sold in eco-conscious California. California Gov. Arnold Schwarzenegger lobbied Toyota to bring the Prius to NUMMI, journeying to Japan for a highly publicized meeting with former TMC President Fujio Cho in 2004. Toyota eventually decided to build the Prius at a new plant near Tupelo, MS, construction of which has been halted due to the recession. Toyota says it will stop taking Corolla sedans and Tacoma compact pickup trucks from NUMMI next March, transitioning the Tacoma to its underutilized San Antonio plant, where its builds the Tundra fullsize pickup. Corolla output will continue at Toyota’s Cambridge, ON, Canada, plant, and in Japan. Toyota says it will allow NUMMI workers to apply for jobs at its other plants but will not prioritize those workers above other applicants. In the end, what did NUMMI in? Merkle says it was a combination of factors, including the high-cost of doing business in California, the well-paid UAW-represented workforce, as well as NUMMI’s location far from Toyota’s other plants and the majority of suppliers in the East. Toyota’s Niimi reportedly denies the UAW was a factor in the auto maker’s decision to stop producing at the plant, blaming the high cost of living in California, instead. Gettelfinger also calls Toyota out on closing a U.S. factory, after benefiting so greatly from the federal “Cash for Clunkers” program funded by U.S. taxpayers. Toyota reportedly saw the highest market share among all auto makers from the recently ended program to get older, gas-guzzling vehicles off U.S. roads and stimulate the economy. The Corolla also was the best-selling new vehicle under the program. Despite the dismal shape of the California economy, Merkle does not believe Toyota’s decision to step away from NUMMI will be detrimental to its sales in the state. California is Toyota’s largest U.S. market, accounting for 15%-20% of its annual sales. “Maybe in the (Fremont area) you’ll have some people who’ll shun Toyotas, but there are probably a lot of people in California that don’t know where their Tacoma or Corolla comes from,” he says.